It is always great to see developing markets in our industry! I am just back from Monterrey, Mexico, where I attended the 19th AMPROFEC Conference, and saw the Mexican exhibition industry upbeat about its future. With more and more international attention on Mexico as an exhibition business opportunity, a number of our industry’s global players are working together with national businesses, while established regional players are expanding as well. UFI will help our members to get even better access to Mexico, while also making it easier for Mexican exhibition players to connect with their international peers. On stage in Monterrey, AMPROFEC President Edward Kelley and I signed a collaboration agreement between our two associations. We are already working together very well on research and mutual support. And we can build on this to do more. It is good to see how our friends from AMPROFEC are working on expanding their offerings, with a structured, systematic approach. Among other things, they are beginning to roll out a certification programme for future leaders in the Mexican exhibition industry, drawing on knowledge and expertise from senior Mexican industry experts to deliver a programme tailored to the country’s needs. Congratulations! During my year as your president, I have already seen similar energy and enthusiasm in a number of other developing markets, as well as in big markets like the US and Germany. Wherever I go, it is great to see that this combination of dedicated national associations together with UFI’s global reach and perspective leads to so much value for the respective market players. As UFI, we benefit from the insights into separate markets to build an international and global view of our industry. 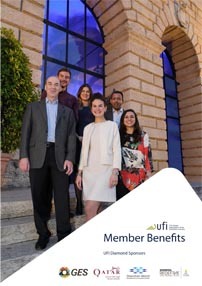 Likewise, the national associations benefit from the global reach they can have through UFI, including access to research, educational content, and a network of exhibition industry professionals around the world. I see this cooperation as a natural “win-win” for all involved. So today I would like to call on all the 56 national and international associations who we work with as members and partners: Keep up the great work you’re doing in collaboration. It makes our industry better!